Last week, we wrote about the bad UX of voting in the U.S. While we strongly believe there should be legislative fixes to solve these UX problems, we have been delighted to see how some U.S. companies and nonprofits have stepped up to remedy some of these issues just in time for the midterms on Tuesday. From Facebook promoting voter registration on their users’ feeds, to the more than 300 companies that have pledged to make Election Day a holiday for their employees, private industry has provided meaningful solutions to some of the most egregious problems with the voter experience. A major UX flaw we highlighted in our previous post is that people have to register on their own. Leaving it up to the voter to register can be problematic, primarily because many don’t know how. The following companies made moves to inform and empower Americans to become registered voters. On National Voter Registration Day (Sept. 25), several social media and other companies participated in an awareness campaign. 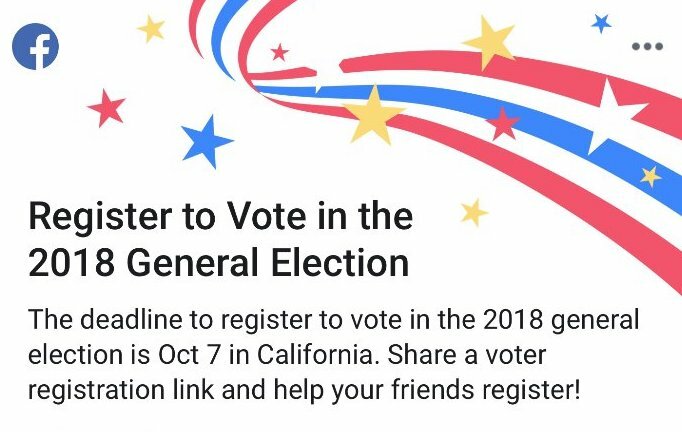 Facebook: On National Voter Registration day, the tech giant offered a shareable link to get friends to register via TurboVote direct from the Facebook news feed. Twitter: In users’ timelines, Twitter shared a link (also to TurboVote) with options for registering, getting election reminders, and applying for absentee ballots. HBO also promoted the hashtag #NationalVoterRegistrationDay on Twitter and offered a text-to-register option. Reddit: Reddit’s designers added a popup message that greeted visitors, encouraging them to vote. The popup included a letter from Reddit CEO and co-founder Steve Huffman about the importance of voting and links to register. Walmart: The retailer created a website with resources to help people get informed about the election. The website includes links to voter registration pages, election deadlines, and candidate profiles. Snapchat: The multimedia messaging app included a link to register on users’ main profile page. The company also created new filters to spread the word about registering to vote. Another obstacle to potential voters is that elections are held on Tuesdays, which makes voting difficult for people with long shifts and/or long commutes. To ease this voting barrier, many companies are giving employees time off on Election Day. Patagonia, Etsy, and Levi’s – These brands are among 300+ companies that have opted to close up shop for Election Day in order to give employees the time to vote (in a joint effort fittingly called Time to Vote). Commitments range from 3 hours’ paid time off to the entire day, depending on the company. Lack of transportation to the local polling place is another obstacle that prevents some Americans from voting. Several companies in the transportation industry are doing something about it. Capital Bikeshare – Washington, D.C.
Riders can enter the code “Biketovote” in their local bike-share app (or “Vote18” in Chicago) to claim the free offer. Lyft: The ride-hailing company is not only giving employees the day off, but offering a deal to customers who use its services on Election Day. It will also offer free rides to people in under-served communities. Uber: CEO Dara Khosrowshahi announced that the company is working with nonprofits to offer free rides on Election Day. The company also added a button to the app to help voters find their polling place. Knowing where to go can also be an issue for many people when it comes time to vote. The following groups are helping to shoulder this burden for voters — as UXers attempt to do for our users — by making information about the nearest polling locations easily accessible via smartphone. ACLU: The American Civil Liberties Union took advantage of an Apple Wallet feature to provide a resource for people trying to vote. The nonprofit’s “UX hack” lets users save the location and hours of their polling station in Apple Wallet, and then sends them a push notification reminding them when and where to vote on the day of. It’s encouraging to see companies and nonprofits mobilize to mitigate the most user-unfriendly aspects of the electoral process and make it easier for more citizens to vote. Ultimately, however, the fixes to America’s electoral problems must be solved comprehensively at a legislative level, not in an incomplete and piecemeal fashion by private bodies. Until then, efforts like these, while helpful, are still just surface-level fixes to deeper-rooted issues. Nonetheless, the widespread participation of so many different organizations goes to show how much public support there is for electoral reform, and how critical it has become that we do something about the current electoral system. Perhaps we can be hopeful that the strong showing this year will help push federal and state governments to take action.